Dozens of concerned parents, teachers, students, administrators and Ferndale School Board Trustees gathered in front of Ferndale High School for an early morning rally and photo opportunity Wednesday, and to send a caravan off on an advocacy trip to Lansing. 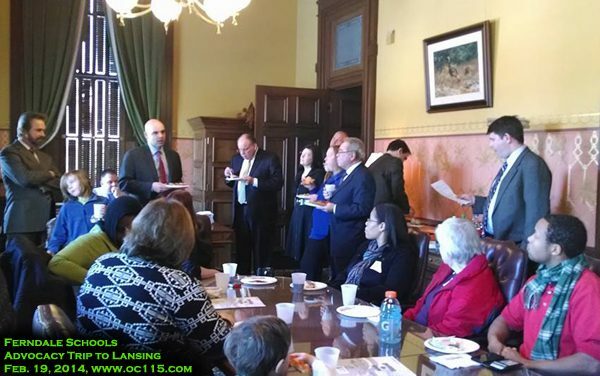 Armed with “Talking points on education funding,” and bearing gifts of donated Garden Fresh Salsa and chips, Ferndale district families met with elected officials in hopes of convincing them to change education funding in Michigan. They dropped off information and gift bags to various Representatives through the building, reaching both Republicans and Democrats. 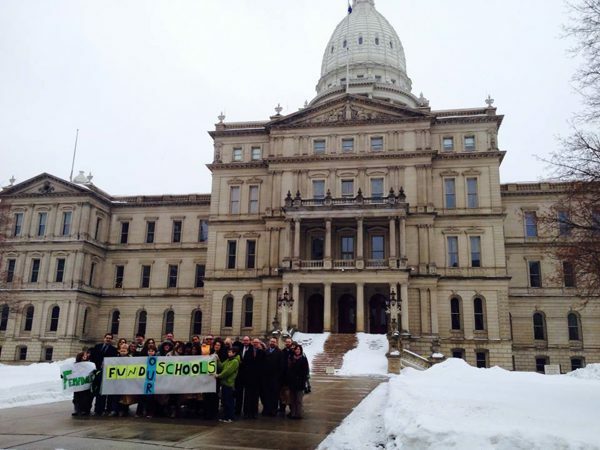 In particular, the group was pushing for support for HB 5269 which calls for a comprehensive statewide cost study to determine the per-student cost of meeting state public education goals. 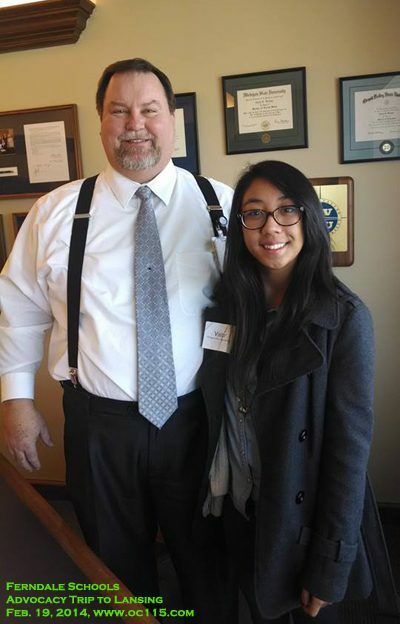 They also opposed SB 402 which would cut income tax, and HB 4571 and 4572 which transfer aviation fuel taxes away from the School Aid Fund, at potential cost of $55 million to schools across the State. 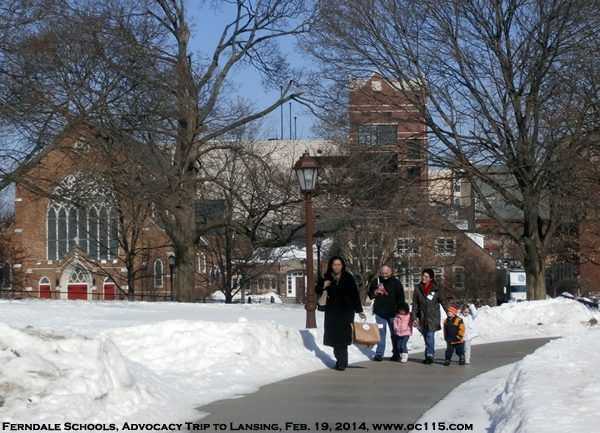 Community members, including parents and students, were able to learn from watching some of the legislative process. They packed into an overflow room to listen in on a House Education Committee hearing. 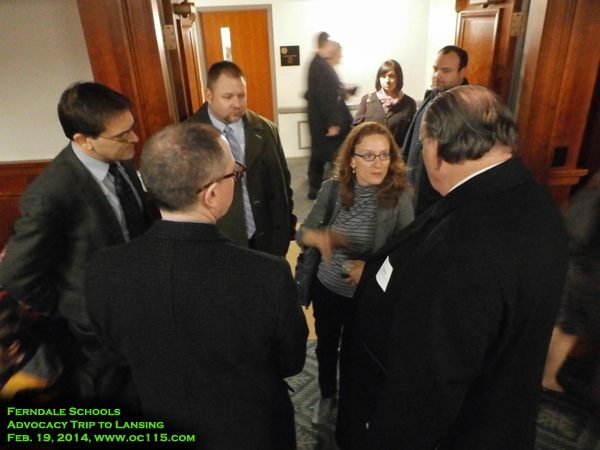 They also had lunch with key legislatures including Representatives Ellen Cogen Lipton, Tim Greimel, and Brandon Dillon. 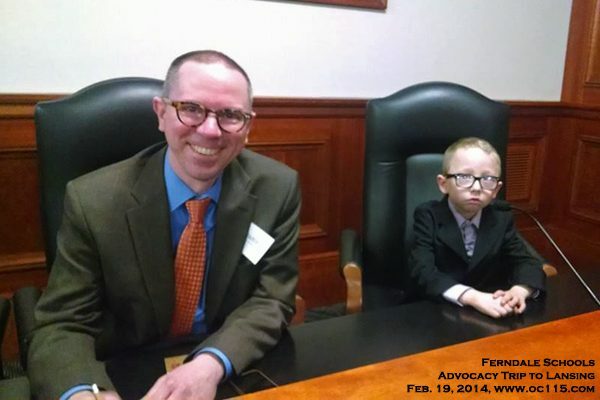 “I’m so proud of everyone, especially our little future activists,” said Ferndale School Board Trustee Karen Twomey. 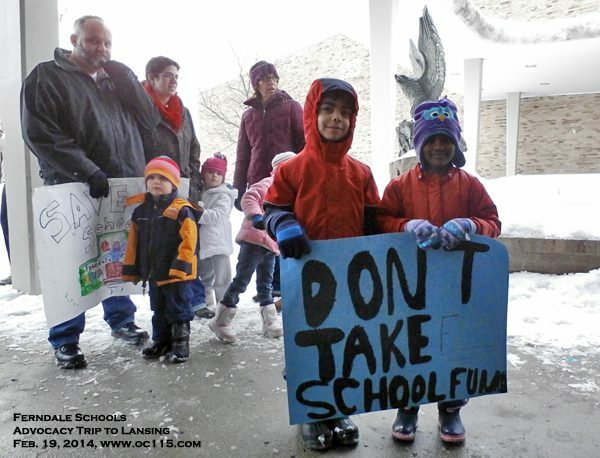 Issues facing school funding were discussed Tuesday in a presentation by School Board Trustee Kevin Deegn-Krause, which can be seen at http://oaklandcounty115.com/2014/02/18/how-are-michigan-schools-funded-video/. Representative Ellen Cogen Lipton has been vocal about school funding and creating a study to look at true education costs. 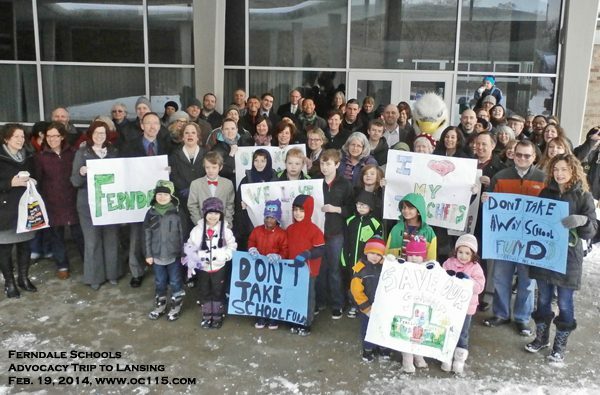 View a previous presentation by Lipton at http://oaklandcounty115.com/2013/11/21/ellen-cogen-lipton-shares-eaa-concerns-education-alternatives-video/.